"Want to hear the Frenchman?" my husband asks. "Yes, oh yes." I say. This is not the romantic interlude you would imagine it to be, but instead a body scan - a guided meditation that reconnects you to your breath and body and soothes you into a deep relaxation. And if you are like me - a mom of two little people who forgets about the Relax + Reflect part of the day until it is too late and I fall into bed completely exhausted at 9:30 - you need something to help you transition from the doing the being. The Frenchman is Gilles Marin, a man with a delicate and gentle voice who with his words, sends me straight into deep slumber, every time. 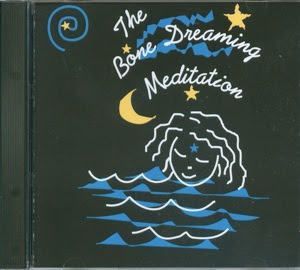 He is the voice behind The Bone Dreaming Meditation, a guided meditation based on an ancient Chinese Taoist practice translated most simply into the practice of bone breathing. This practice can help the body and mind attain deep relaxation that can help to reduce physical pain, mental disruption and aid in reaching and maintaining deep, restorative sleep. First introduced to me 6 years ago by Erene Lejeune, a friend and gifted practitioner of Chi Nei Tsang, it has become an occasional part of our nighttime routine. I say our for at some point along they way, my husband learned the benefits of this bedtime ritual on his own. And now, in the age of iPhones and apps, the Frenchman is with us, even faster, for he was one of the first CD's I scanned and sent straight to my iTunes. Now, he can go where ever we go. I had forgotten about him until this morning and realized that it is just about the perfect time to bring him back. If you find yourself with a racing mind and an aching body, unable to calm yourself enough to get the restorative sleep that you need, consider this. Seriously. Just a quick note to say we're delighted with your pleasure in Gilles' CD and we thank you for writing so charmingly about it ;-) Nothing better than good sleep, is there? [signed] Gilles' staff at the Chi Nei Tsang Institute in Oakland, California.